Fantasy Football QB Start/Sit Rankings (Week 11) - Fantasy Football, Fantasy Football Rankings | Mac Bros.
*Any additional updates that are necessary will be posted no later than Saturday in the final Week 11 (2009) rankings. 1. Drew Brees (NO) – There really isn’t much to say here. You have one of the NFL’s most dangerous QB’s facing one of the NFL’s most fantasy friendly pass defenses. 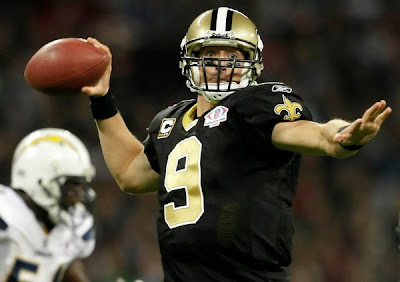 Brees should light up the Tampa Bay secondary all day and he is a must start fantasy option for this extremely favorable match up in week 11. 2. Peyton Manning (IND) – It wasn’t long ago that a match up against Baltimore would bring cause for serious concern, even for Peyton Manning owners, but this isn’t your old man’s Ravens and Peyton should handle them with ease. Sure, the Ravens rank a respectable 13th in the NFL in pass defense, but those numbers are a bit padded considering that they have already played the inept Browns twice and a Kansas City passing attack that was led by Brodie Croyle at the time. The fact is, that when the Ravens have faced a capable passing attack this season, they have failed miserably and they will face one of the best the NFL has to offer in week 11. Baltimore losing star LB Terrell Suggs with a knee injury should also help Manning’s cause in this match up. For what it’s worth, Manning threw for 271 yards, 3 TDs and 0 interceptions in a game against them last season. 3. Kurt Warner (ARI) – He can be a bit of a wild card, but Warner has been red hot in his last 2 games and a week 11 match up against the Rams holds promise galore. St. Louis ranks just 26th in the NFL in pass defense and only 3 teams give up more fantasy points to opposing QBs on a weekly basis. That should translate into yet another big week for Warner and the Cardinals high powered passing attack. 4. Tom Brady (NE) – While the Jets were able to hold a rusty Tom Brady to a season low fantasy total back in week 2, we seriously doubt they will be able to put the brakes on this passing attack twice in one season, especially with the game being played in Foxboro this time around. Brady has since returned to elite form and he should benefit greatly by having a healthy Wes Welker in the mix which was not the case back in week 2. There is no question that the Jets have a formidable pass defense, but Brady and Bill Belichick should find a way to pick them apart in week 11. 5. Matt Schaub (HOU) – In week 2, Schaub completely dismantled the Titans pass defense, lighting them up for 357 yards and 4 TDs. Based solely on that, you have to like his chances for another great performance against Tennessee this time around at home. That being said, he has not been at the top of his game of late and the Titans have made significant strides in both their pass rush and pass defense over their last few games. So, if you are expecting Schaub to match his monster week 2 totals against them, you may be in for a bit of a let down. Regardless, we still expect him to put up very solid numbers and he should be penciled into fantasy line ups as a QB1. 6. Aaron Rodgers (GB) – On the one hand, a week 11 match up against a 49er pass defense that ranks 29th in the NFL in passing yards allowed bodes very well for Rodgers. On the other hand, the San Francisco pass defense is actually pretty solid where it counts the most with regard to fantasy as they have only allowed 9 passing TDs all season. There are only 5 teams in the NFL that have allowed fewer. Despite that fact, we have little reason to doubt that Rodgers will have a very productive week 11. After all, he does have the longest streak of multiple TD games of any QB in the league (7 consecutive) and he currently ranks at the top amongst NFL QBs in terms of fantasy production so far this season. 7. Ben Roethlisberger (PIT) – He is coming off of his worst fantasy performance of the season in week 10 against the Bengals, but he should make up for it with a very favorable week 11 match up against Kansas City. The Chiefs rank just 24th in pass defense, they have a weak pass rush and rarely intercept passes which is key for Roethlisberger’s success, and they have allowed more pass plays of 40 yards or more than any other defense in the NFL (12) which also bodes well for Big Ben with 3 big play receivers at his disposal. He should rebound nicely with this match up and it is safe to pencil him into week 11 fantasy line ups. 9. Donovan McNabb (PHI) – A week 11 match up between an up and down McNabb and a Jekyll and Hyde Chicago pass defense isn’t the easiest to gauge, but our money is on McNabb this week. He is coming off of a huge week 10 performance and in spite of the fact that the Bears rank a solid 8th in the NFL in terms of passing yards allowed, they give up plenty of TDs through the air. In fact, only 10 teams in the league have allowed more fantasy points to opposing QBs than Chicago this season. As sporadic as McNabb can be at times, that alone merits using him as a QB1 in week 11. 10. Phillip Rivers (SD) – In week 11, Rivers will get a much anticipated rematch against a Denver team that has been on the down slide of late. That being said, the Broncos still have one of the better pass defenses in the league and they did an adequate job of limiting Rivers to a mediocre stat line back in week 6. While he should fare better this time around, this is not a fail safe match up for him. He is certainly capable of big production against anyone which qualifies him as a low end QB1 this week, but a talented Denver secondary will not make it easy for him. 11. Tony Romo (DAL) – His numbers have tailed off a bit in the last 2 weeks playing on the road against solid opposition. Romo will face yet another tough test in week 11 against a Washington pass defense that is ranked 1st in the NFL for a reason. That said, you still have to like his chances for success in this match up. Romo has a great track record against the Skins when playing at home over the years and he has been money in his last 2 games at home this season throwing for 567 yards with 6 TDs and no picks. While this match up does have some potential stumbling blocks, the Redskins are not bulletproof against the pass and you should be safe with Romo as your fantasy QB1 this week. 12. Matt Hasselbeck (SEA) – While the Vikings defense does plenty of things well, defending the pass is not one of them and Hasselbeck has the weapons to put up solid numbers against them. Minnesota ranks just 23rd in the NFL in pass defense and they have given up the 8th most fantasy points in the league to opposing QBs so far this season. Hasselbeck isn’t the safest fantasy option, but the match up is favorable enough for serious consideration this week. 13. Eli Manning (NYG) – Sure, he went through a rough patch, but Peyton’s little brother seemed to have regained his poise against San Diego in week 9, he has a great match up at home against a shaky Falcons pass defense and he has had two weeks to rest up and prepare for this game. It may be time to give him another look in week 11. 14. Carson Palmer (CIN) – The last 2 weeks haven’t done any favors for Palmer’s fantasy value and contrary to popular belief, the Oakland pass defense is actually fairly solid. That being said, Palmer is due to rebound and a stout Bengals defense against a terrible Raiders offense should create great field position and scoring opportunities for Palmer in the passing game. Call us crazy, but we like Palmer’s chances with this match up. 15. Jay Cutler (CHI) – As some really old guy once said, “that kid has a million dollar arm and a 2 cent head”. We think that saying suits Cutler perfectly which is kind of ironic when you consider that he attended prestigious Vanderbilt University which is notorious for producing weak armed QBs with high IQs. Regardless, Cutler is a wildcard and you can’t count him out for a big performance against anyone, including Philadelphia in week 11. At the same time, he is not to be trusted against even the weakest of pass defenses. All you can do is roll the dice and pray that Cutler doesn’t throw 5 picks costing you any chance of winning your fantasy match up.